The Gallery has an open stock room with an extensive selection of works by the artists whom the Gallery exhibits and supports. It is regularly updated and the works may be viewed online or in person by appointment. Free delivery to your home or office in the Canberra region. Milingimbi is an island off the north coast of Arnhem Land some 400 kilometres to the east of Darwin. The population of around 1,000 that calls Milingimbi and its outstations home includes about 13 different clan groups. Using traditional ochres and white clay, its artists create paintings on bark and canvas, based on the body art applied during religious ceremonies that are still part of everyday life in this small, remote island community. It is an art that is informed by the deep cultures of the region and the diversity of those cultures, which have been influenced by their proximity to Indonesia and particularly by a long history of contact with traders from Sulawesi. The colours used for art production by the Milingimbi people are associated with the dreamtime Dj’ankawu sisters, who travelled through north east Arnhem Land creating spring water, languages and culture amongst Yolgnu people. Joe Dhamanydji is a guardian of cultural knowledge, not all of which can be shared with non-Indigenous people. He is the youngest son of renowned artist and cultural leader Tom Djawa. He grew up in Milingimbi and has been painting since he was at mission school. Joe makes works associated with the buralla (diving duck), yangurra (turtle), gunatdarra (heron), munbirri (catfish), lumba-lumba (emu), yuka (crab), minmindjark (water hole), djanda bininmirr (water goanna) and djalunbu (hollow log coffin). He also paints designs associated with the Dja’nkawu Sisters from his mother’s side. Raymond Bulambula was born in Milingimbi and raised at Rapuma Island, his mother’s country, to the east. When he was a young man he set off to his late father’s country at Langarra Island and learned his sacred stories from his father’s nephews. Raymond makes art from three sources. He paints the morning stars that belong to his mother’s side (Gurryindi) and to the Mallarra side, but most of his paintings come from the Mandjikay Wobulkarra side, which belongs to the Langarra people. His favourite subjects are the latjin (mangrove worm and tree), the monuk gapu (salt and fresh water with bubbles) which flows from the creek to the sea, and the warraka (cycad). He now lives at Bordia outstation on Milingimbi Island. Gloria Petyarre (Pitjara) is arguably the most significant female Indigenous artist working today. She is internationally acclaimed for her 'Bush Medicine Leaf' paintings. She comes from the remote settlement of Utopia in central Australia, home to many of Australia's foremost Indigenous artists, including Gloria's renowned aunt, Emily Kame Kngwarreye, the most famous and accomplished female Indigenous artist Australia has produced. Gloria and her family members first became interested in art making by participating in the Utopia Women's Silk Batik Group introduced in 1977, and which became the inspiration for the artists and a tremendous success both in Australia and overseas. Another successful project introduced in 1988 taught the artists to paint with acrylics on primed, stretched canvas. As demand for art from Utopia grew, so did Gloria's career. She exhibited in France, Germany, the United Kingdom, Belgium, the Netherlands, Italy, the USA and Japan, as well as in regional and commercial galleries throughout Australia. In addition to her paintings of bush medicine leaves, that became one of the most popular styles in Indigenous art, Gloria also paints the Thorny Mountain Devil Lizard Dreaming, Grass Seed, Pencil Yam, Emu, Bean, Small Brown Grass and Body Paint dreamings. She still does medicine leaf paintings but in recent years she has produced massive 'Big Leaf' paintings, executed with giant brush strokes that mix colour on the canvas to gain a variety of unique effects. 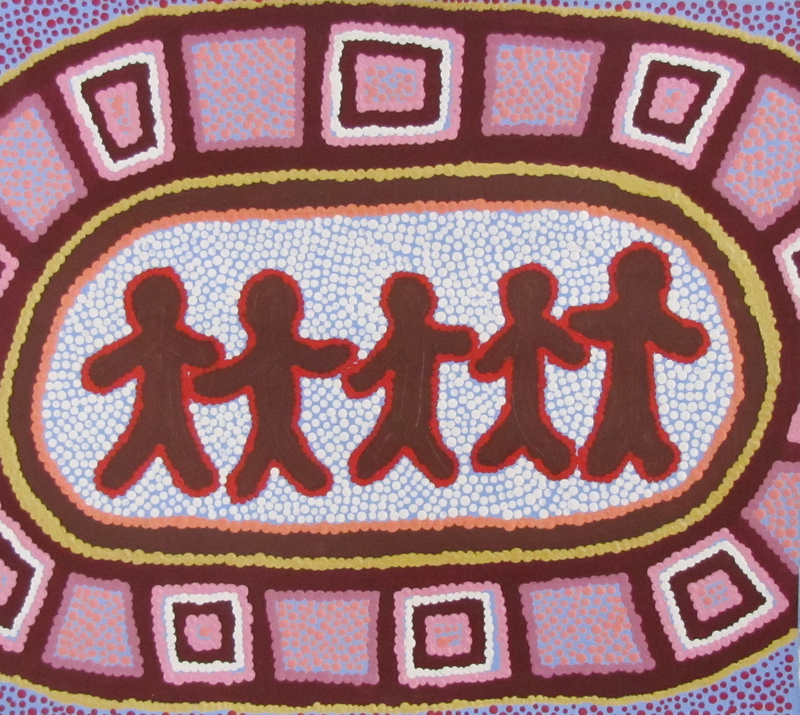 Jeannie Petyarre (Pitjara) was born in 1951 at Boundary Bore, a small Aboriginal outstation in the Utopia region of Central Australia, into a family of distinguished Indigenous artists. She is the niece of Emily Kame Kngwarreye sister of Rosemary Petyarre and the sister of Gloria, Kathleen, Ada Bird, Violet, Myrtle and Nancy Petyarre. Jeannie was introduced to modern art mediums through her involvement in two highly successful community projects in Utopia in the late 1970s and 1980s. The first introduced the women of Utopia to silk batiks. The second introduced them to canvas and acrylic paints. She was encouraged by her aunt, Emily Kame Kngwarreye, to continue to paint her family’s “Yam Dreaming”, a particular potent Dreaming for the women of Utopia, and which was passed down to her from her father’s side. The yam is prized by Aborigines for its medicinal properties and Jeannie depicts its seeds, leaves and flowers in their various stages of growth. She also depicts the awelye ceremonies in which the women participate to honour their ancestors. Typical of Utopian artists, Jeannie makes great use of colour and her work is characterised by vibrant designs. Mary Dixon Nungarrayi was born in 1958 near Town Bore Creek, east of Papunya, and grew up in the area around Haast Bluff, which she regards as her country. She later moved to Mt Liebig to be closer to Walpiri country where her native language, Wilpiri, is spoken. She started painting in the mid 1980s for Papunya Tula Artists. 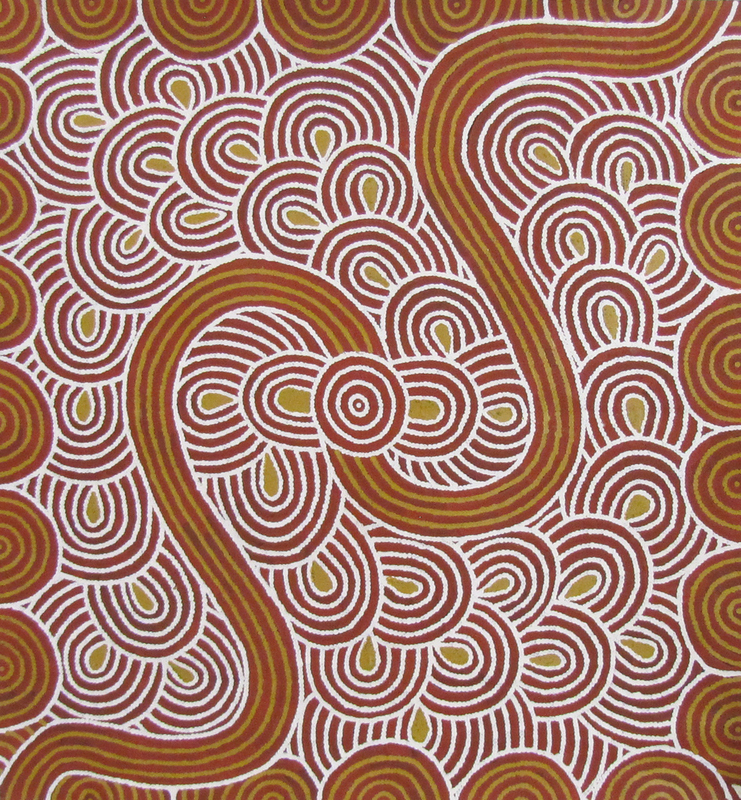 Mary uses bright primary colours in acrylic on canvas to produce lyrical paintings of witchetty grub and bush plum dreamings. She also paints the Milky Way and the Seven Sisters of the Tjukurrpa Dreaming (the constellation Pleiades), a Dreaming that is closely associated with secret men's ceremonies. Katherine Napaltjarri Parker is a Pintubi woman who was born in 1978 at Kintore near the Northern Territory border with Western Australia and South Australia. She has been painting since she was a child and she became part of the Papunya Tula artist collective when she was 17-years-old. All of her Dreamtime stories come from the Alhalkere Country and were passed down to her from her father's side. 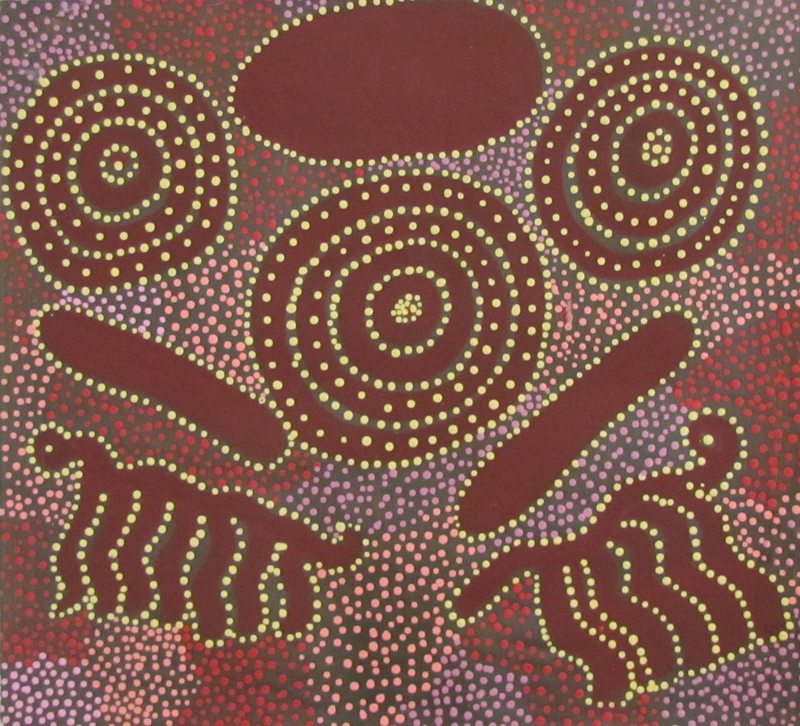 The cultural importance of these stories and her use of traditional techniques has made Katherine’s work rich with meaning and has contributed to the continued understanding by the desert peoples of their connection to country and the dreamtime. Her paintings have developed over the past few years and while they still display her deep understanding of the traditional dreamtime stories, bush medicine and her country they are told in a more deeply personal style. Her work typifies the character of indigenous painting, in which the designs often have many interrelated symbolic meanings. The narrative elements - the painting’s story or Dreaming - is only one level of meaning. The imagery employed by indigenous artists has deep cultural resonances. The non-indigenous viewer can, however, intuitively feel the power of this spiritual resonance without necessarily having to understand the full meaning known only to the initiated members of the community. Etchings by Artists from Warmun, WA.